Our farm-raised whole frozen chickens, and frozen packages of boneless skinless breasts, wings, thighs and drumsticks are now available at our Farm Store. Our meat birds come to us at just 2-3 days old. They keep warm under a heat lamp, and are able to eat and drink out of special baby chick feeder just their size! 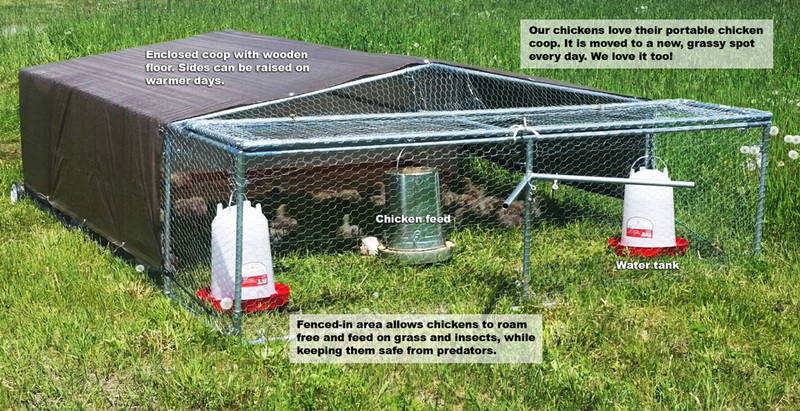 When they grow their feathers and no longer need the heat lamp they are moved outside to a chicken tractor. This is just a fun name for a moveable chicken coop. We move it every day so they get fresh grass to nibble on, insects to dig for and dirt to bathe in. Our chickens are never fed antibiotics. They enjoy eating the grass and insects they find outside, as well a supplemental grain to round out their diet. Our birds are never given hormones or antibiotics. If you are interested in purchasing chicken from us, please contact us. The Farm Store hours are listed on the footer at the bottom of this page. Click on the buttons below for our basic poultry cooking guide and our price chart. For more about out safe handling and cooking methods for chicken review and print this online guide provided by the USDA: USDA INFORMATION .